3. You’ll get default ValuesController. 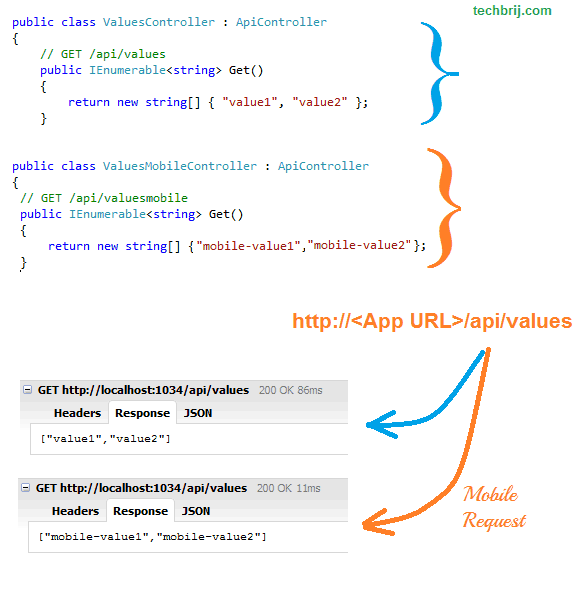 When you access <your app url>/api/Values, the array of string value1, value2 is returned. To create separate action for mobile request, We are going to create separate controller having ‘Mobile‘ suffix. To differentiate both controllers, replace value1, value2 to mobile-value1, mobile-value2 in get method. 4. Now our object is to call action of Mobile controller when request comes from mobile device. In this RouteHandler, Request.Browser.IsMobileDevice checks whether request comes from mobile browser and change controller name with ‘Mobile‘ suffix. Now run app on browser, For testing, You can change user-agent to iPhone with user agent switcher Firefox add-on and open same URL. you’ll get mobile-value1 and mobile-value2.